It is remarkable that EUCLID’s online MBA in Islamic Finance program was developed as a Joint Initiative between EUCLID (an intergovernmental treaty-based institution) and ICCI (now ICCIA, the Islamic Chamber of Commerce, Industry and Agriculture), in 2008. It is at the convergence of EUCLID’s expertise in global governance, international civil service and interfaith studies. This MBA begins with a strong and award winning (see MBASD) MBA core and continues with advanced courses in both Islamic economics and finance. It is the only online graduate program in this important field of academic study and professional practice organized by an international intergovernmental organization and officially used by active civil servants over 4 continents. In this regards, it is an excellent choice for both Muslim and non-Muslim students alike. This specialized MBA represents a minimum of 36 credits (“ICH” as used in North America) but often reaches 40 or 42 credits (equivalent to 120 ECTS) for students who wish to also do a thesis as part of their course of studies. The thesis is often a proof of concept for professional application or further studies at the doctoral level. 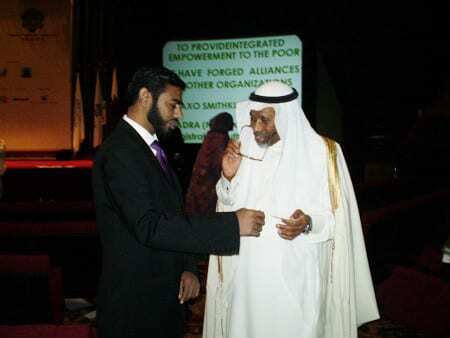 Photo above: EUCLID’s Secretary General Syed Zahid Ali with the President of the Islamic Development Bank (2008). EUCLID became an IsDB Partner in 2014. The EUCLID DIFE provides outstanding professional and academic preparation to its students for a successful career in Islamic finance at the international, regional, national and local levels. Outlook includes teaching positions, banking positions, and economic policy positions. There is also increasing demand for experts in Islamic finance and economics in non-Muslim countries and institutions, and one does not have to be a Muslim to study Islamic finance. EUCLID alumni have been successful securing employment and promotions in government service and international organizations, including at the level of ambassador and minister. EUCLID’s MBA in Islamic Finance program is supported by a world-class faculty group which is truly global in scope and dedicated to high-quality interaction with each student. For each program, 3 faculty members are featured below, and the full faculty roster is accessible via the top menu. The full MBAIF Brochure can be downloaded in PDF format. EUCLID is the only intergovernmental, treaty-based university with a UN registered charter and recognized expertise in Islamic finance. EUCLID is a partner of the Islamic Development Bank (IsDB) and Islamic Chamber of Commerce, Industry and Agriculture (ICCIA).